Content marketing is one of the most effective strategies that you can use to deliver relevant information and attract more audience. 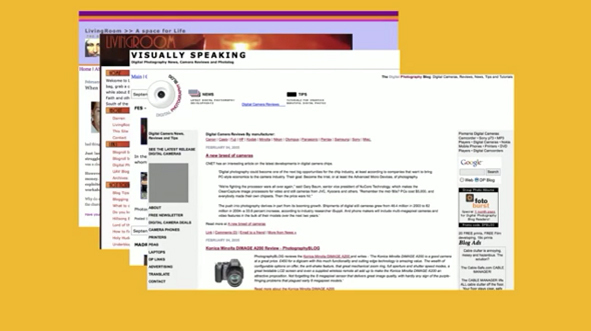 In this presentation, ProBlogger founder Darren Rowse shares some things that you need to remember when creating content for your readers. 02:05 – What is Darren’s story? 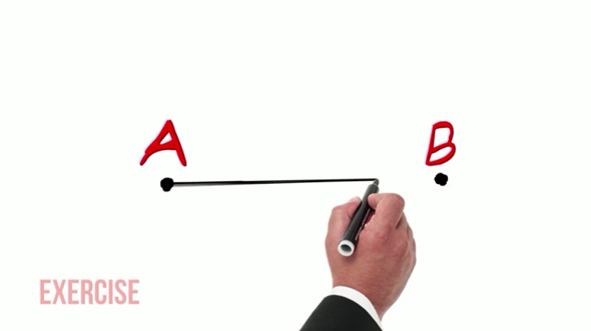 09:25 – What is it that you do? 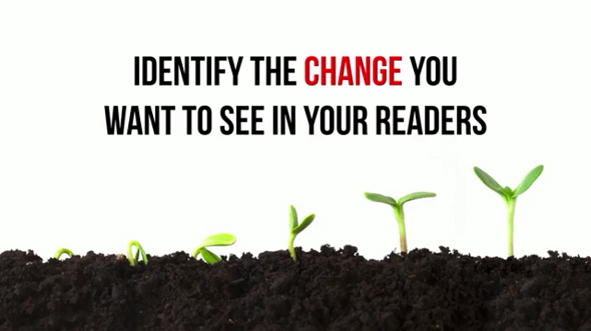 16:00 – How will you change your readers? James: OK. So our next guest is a super power in the blogosphere. In fact, I remember going to an event, my first event in the United States several years ago, and I’d found out he’d been to one before that, one of the early ones, and I found a transcript of what he’d been doing and what he talked about, and I read through it, ‘This is great.’ It’s probably one of the seeds to my original sort of direction towards content marketing. And then I recently saw him in the Philippines presenting, and I thought, ‘This information is very in line with what we do. His version of what I talk about with OTR, but he’s been doing it a lot longer than I have. He can do things like write, and spell, he’s prolific, and he’s really, really good at it. 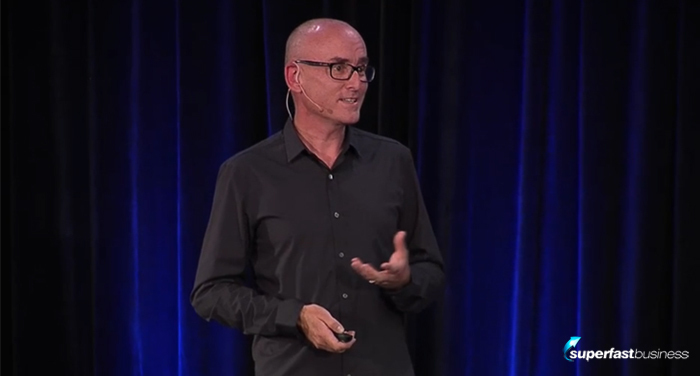 So without further ado, I’d like to introduce Darren Rowse. Come on up. Darren: Wow thank you. It’s really good. Who’s feeling like they’ve already got enough value from this and they could go home almost like I (raising hand). Literally in the lunch break, I had to rewrite the opening story of my talk. Thanks to an earlier presentation. I put all my content onto an app. Thanks Jarrod. I’ve killed my idea for the ProBlogger album and T-shirt range. I actually did. I have been considering doing a pajama range, ProBlogger work wear for bloggers. I’ve had to call the team and tell them to put all the content behind the subscription. I’ve deleted all the apps on my phone and I just took a hot and cold shower. It’s been a busy lunch break. I hope you’ve had as a productive one. I want to talk about content marketing and to help you to kind of understand the perspective that I come to this topic from. I want to tell you a very brief version of my story. I got an email a couple of days ago basically saying with guidelines for speakers and it was basically, “Cut out all your story because people just want the tips.” I’m like, “But that was the first 20 minutes of my talk gone.” So I’m going to tell it to you in two minutes, and it does skip over some of the stages of the format for storytelling before. But for me it all started in 2002 with an email from a friend. I was sitting at a desk at one of the part-time jobs that I had, and this email pinged in. A voice said, “Vat master, you’ve got mail.” Did anyone else install that? I was the only one. OK. I had no idea what a blog was, so I clicked the link out of curiosity. I ended up on this site that changed the course of my life. Not because of the content, although that was interesting, but because it was my first discovery of blogging and of this amazing tool called a blog. What I found on this blog was this tool that enabled this guy on the other side of the world living in Prague to talk to me in a really powerful, personal way. It amplified his voice in a way I’d never seen a voice amplified before. I’ve done some public speaking, I’d never had my voice amplified in that way. And around his voice was this community. Everyone was getting smarter as a result of not only what he was saying but the fact that there was a community there. These two things captivated me. And within a couple of hours, I decided I needed to start a blog. Now unfortunately, I had no credentials whatsoever to start a blog, and if I’d thought about it from any more than about five minutes, I wouldn’t have done it. I’d had 20 jobs in the last 10 years. None of which had anything to do with blogging. 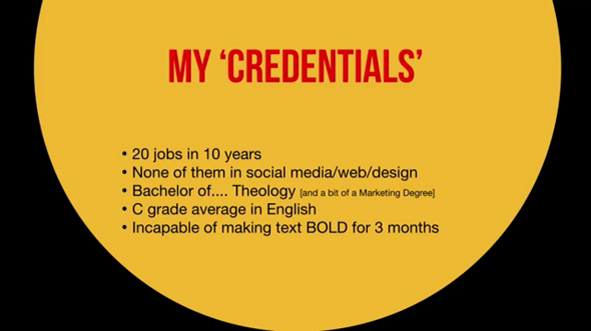 The only qualification I had was a Bachelor of Theology, which hasn’t really helped a whole heap. I wasn’t a great writer. It was my worst subject in high school and I was incapable of making text bold on that blog for three months after starting it. Back then you had to know a little bit of html, and I had no idea, technological luddite. But for one reason or another, I started that blog, and that was the best thing that I’ve ever done in business. This is what it looked like. It was ugly. I designed this myself. It was based upon my wedding invitation, which makes me doubt my wife’s choice in colors. But if you’ve seen her blog, she’s a very colorful person. Anyway, I did meet some people who knew how to make text bold and they eventually redesigned my blog for me. It was a personal journal of sorts. I was writing about spirituality, politics, movie. It was pretty much an outward pouring of what was in my mind, which was quite scary. 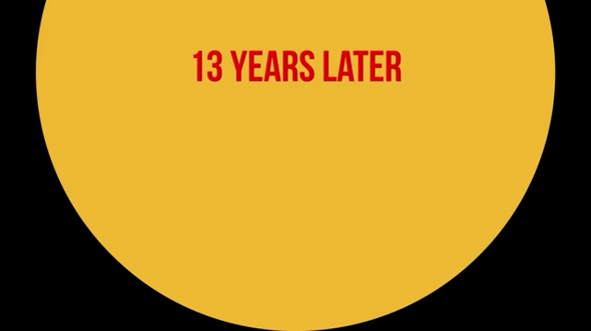 What was even more scary was that thousands of people a day found it and read it. I didn’t know why but I was quite happy that they did. Now I became very, quickly addicted to blogging and creating content with no intent whatsoever of making it into a business. It was just a hobby. It was something that I did for pretty much seven hours every night when I got home. It was a big part of my life and it became an addiction. I began to experiment with other blogs over time. My next blog was a photo blog. I was going to share photos of a trip that I was taking to Morocco with my wife, with my brand new digital camera. It turns out no one at all looked at any of the photos, but I posted one review of the camera I was using, and it ranked number one on Google for that camera. The entrepreneurial lights began to go in my mind, and I transitioned that photo blog onto a digital camera review blog where I wrote reviews of other cameras and aggregated reviews that other people were writing around the web. It was a good time to start a digital photography blog because digital cameras were just starting to really take off. In 2004, blogging had become a part-time job. In fact, it had almost become a full-time job with this particular blog. I started to put some AdSense ads on my blog and some Amazon affiliate links to earn those 4% commissions on those $10 books. I didn’t really earn a lot but it was the beginnings of a part-time job, which over the next year, became a full-time thing for me. In 2004, I started ProBlogger. It was pretty much me saying to the world, you can make a living from blogging and is anyone else doing it out there? Because no one was writing about it. It was my attempt to find other people on this same journey to learn from and to share what I was learning with. I transitioned my photography blog into Digital Photography School in 2007, and this is my main blog today. It’s about 10 times larger than ProBlogger. ProBlogger is a bit of a side project for me, which pays a full-time living in and of itself, but this is the main thing that I do today. It’s a how-to-take-photography type site. So 13 years later, I’m not the biggest blogger in the world, and I’m not the best blogger in the world. But given the fact that I had no idea what I was doing when I started, I’m pretty pleased with what’s happened as a result of it. There’s a whole heap of numbers there, which I pinch myself at. But the thing that I really love about what’s opened up for me is the opportunities. The opportunities to write a book, to start a conference, to speak at amazing events like this, and meet amazing people. But the best thing of all is when people come up to me at a conference like this, as happened this morning and say things like, “You wrote this post that changed my life. In some small way, it helped me to start a business,” or like James said before, “It influenced the way I do things today.” That is something that I get really excited about. That’s the biggest compliment for me. So 13 years later, I find myself as a full-time blogger. Blogging and content marketing for me really tap into this quote that you’ve probably heard a million times before at conferences like this. 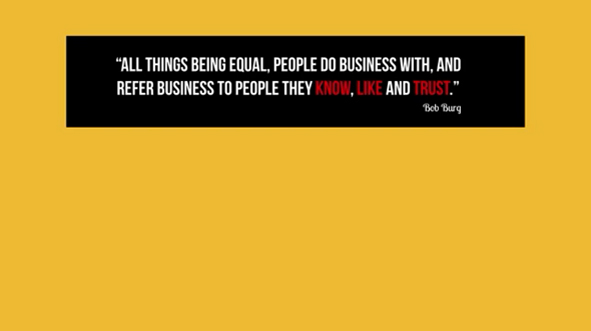 People do business with those they know, like and trust. Content has the ability to help you to be known. Who would’ve ever thought I would have been known by 4 million people a month, to be liked? Who would have ever thought that someone would walk up to me this morning in a conference and give me a hug? I’m an introvert. I don’t like hugs. But I love the fact that people actually feel like they know me and they like me. It opens up opportunities for you to be trusted. 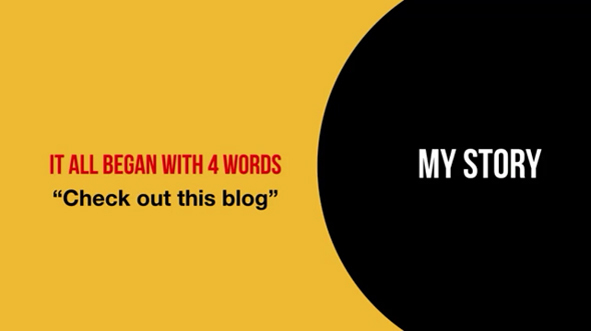 This is what content marketing, this is what blogging is all about for me. 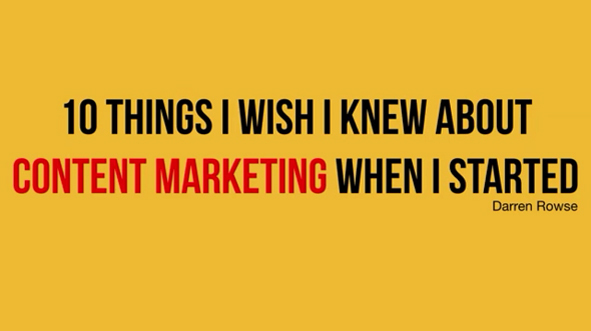 I want to say right upfront whilst I’m talking about content marketing today, I’m doing it as a blogger. So a lot of what I’m going to share today comes out of that experience. 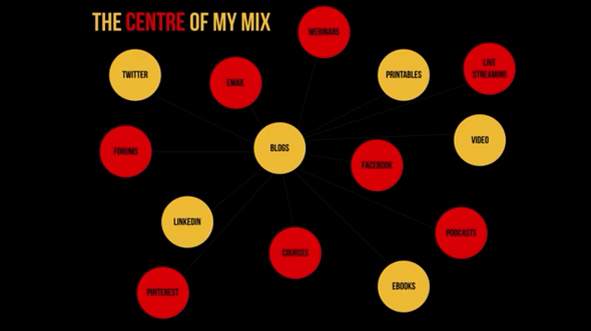 Blogging for me is the center of the mix. These are all of the other things that I do with my time, and I could probably add some more circles to that. This week, I started on an app called Anchor. I don’t know if anyone started playing with Anchor. It’s like an audio version of Twitter. It’s fun. You leave a message and then everyone else leaves a voicemail message effectively back on your message and a conversation happens that way. It’s a really cool tool. So anyway, I’m always experimenting with lots of different things. For me, the blog is the center of the mix though, and whether that’s the case for you, or whether a podcast is that, or whether it’s something else, I think pretty much everything that I want to share this morning and the 10 things that I’ve learned since I started applies to pretty much any medium and most of the models that you’ll be experimenting with before. So I’m going to whip through 10 things. The first two are fairly foundational, then we get a little bit more tactical as we go along. This is something you’ve probably already thought about, but I think it’s something that you really need to come back to on a regular basis. 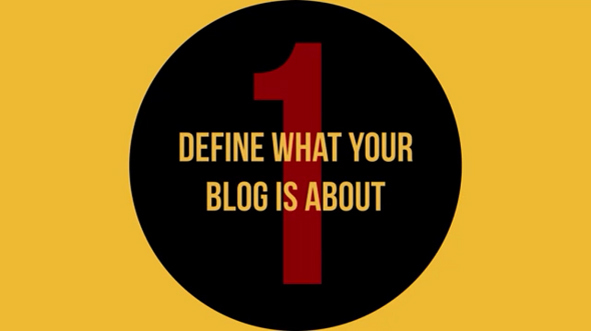 Define what it is that your blog, or your podcast, or you are about. There’s a variety of ways that you can think about this. 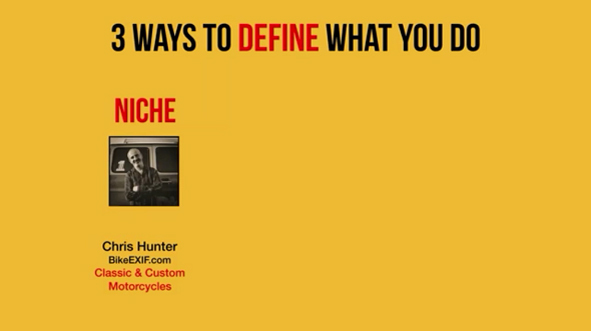 The most common of which is to choose a niche and to think about that niche. Has anyone got a niche in the room that you would say you’ve got a niche? My blogs are, I’ve got a photography blog. That’s my niche. I’ve got a blogging blog. That’s a niche. This is Chris Hunter. He’s got a great blog called BikeEXIF. It’s about custom and classic motorbikes. He’s the only male I know who’s got something like 400,000 or 500,000 Pinterest followers. A lot of people say Pinterest is for women only. No way. There’s a whole heap of men on there and they’ve got their own niches. So he has a niche. I’ve got a niche. 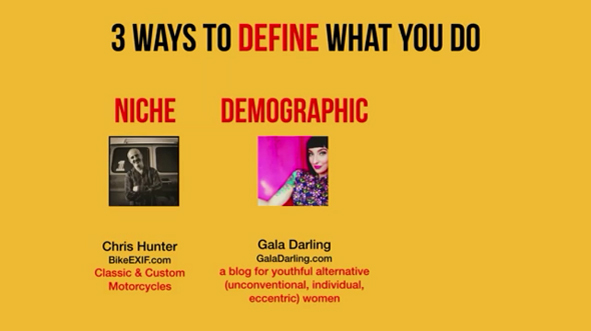 A lot of bloggers though that I meet say, “I don’t really want to just write about one topic.” So another way to define what you’re on about is to think about your demographic. This is Gala Darling. She writes about travel, horoscopes, tattoos, relationship, travel, all kinds of stuff. But they all relate to the one kind of person. So she thinks about her blog as a blog for youthful, alternative, unconventional, individual, eccentric women. Her words, not mine. That’s her demographic. And the third way I think is you can add to these other two and that is to have a fight. I think this is a particularly powerful one. ProBlogger, when I started in 2004, it was a blog about making money from blogging. That was quite a controversial thing to write about in 2004 because blogging was seen as a very pure medium. So for me to say I’m making money from blogging and I’m making six figures from it back in 2004, that caused quite a stir. People really reacted to that in one of two ways. Some people said, “He’s lying.” Other people said, “You can’t or you shouldn’t make money from blogging.” And other people said, “Yeah. I want to do that too.” So for me, the fight of ProBlogger back then was that you can do it, and you can actually do it in an ethical way. That was like me putting a flag in the sand, and people either reacted against it or they rallied around it. A lot of people were inspired by that idea. A lot of people shared that journey. So having a fight for what you do is a very, very powerful thing. My wife, she’s a star blogger. She has a niche, style, fashion, homewares. That’s her niche. She has a demographic as well. She writes for moms. She also has a fight. And it comes out in a lot of the content that she writes. You don’t have to give up on style when you’ve got three little, I was going to call them brats, boys running around in your home who fight against that stuff. That’s her fight. And that’s something that really resonates with a lot of moms. And so she weaves that into her blog and people rally around it. When you’ve got a fight, you give something for people to join, and that’s a very powerful thing when it comes to content. So what is it that you do? This is something I go back to quite regularly and think about. The other thing I’d say about choosing what you do, choose something that’s meaningful to you. You’re going to be at this for a while. So you might as well do something you enjoy and something that’s meaningful to you. And if it’s meaningful to you, it will shine through in the content that you create. I’ve had 30 blogs over the years. I have to say 28 of them I started because I thought they’d be profitable, and they didn’t really mean a whole heap to me. I couldn’t sustain them, and people who came across those blogs could tell that they weren’t meaningful to me so they didn’t come back again. So choose something meaningful to you. 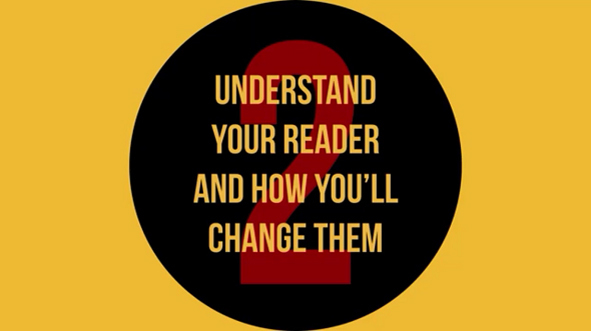 Number two, understand your reader and how you’ll change them. Now most people have kind of been through some sort of an exercise like this. And they’ve created something like these. 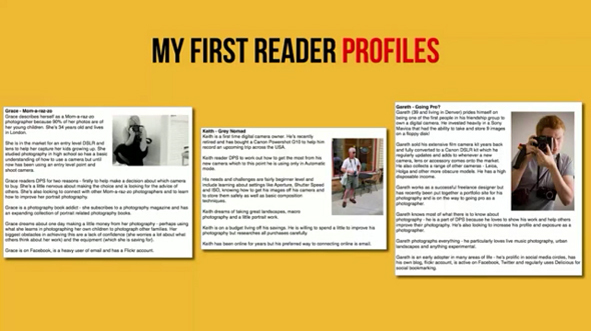 These are reader profiles that I created when I started Digital Photography School in 2007. Some people would call them personas or avatars today. I know some people like personas and avatars. Other people don’t. But what I would say to you whether you’ve got one or not, you need to understand who is reading your blog. 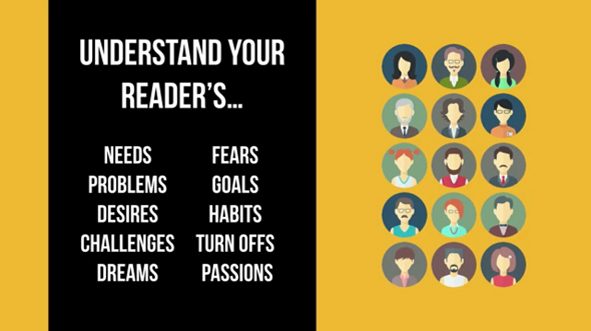 The better you understand them and what is meaningful to them, the better position you’ll be in to create great content, to find more of those readers because you’ll start to understand where they’re hanging out. You’ll also understand how to build community with them. And you’ll suddenly get ideas for how you monetize as well. So the better you understand who is reading your blog, the better. But here’s the thing, most people’s avatars, most people’s understandings of their readers ends at, ‘They’re 34, they’re male, they live in these sorts of cities,’ their demographical information. That’s good to know. But you need to understand these kinds of things. You need to understand their needs. You need to understand their problems. You really need to understand their desires, where they want to be, their dreams. Those things are really powerful things to understand. You need to understand their fears. Their fears are the things that are stopping them to get to their dreams. Even if you just understand their dream and their fear, that’s a very powerful thing to understand. It will inform your content. 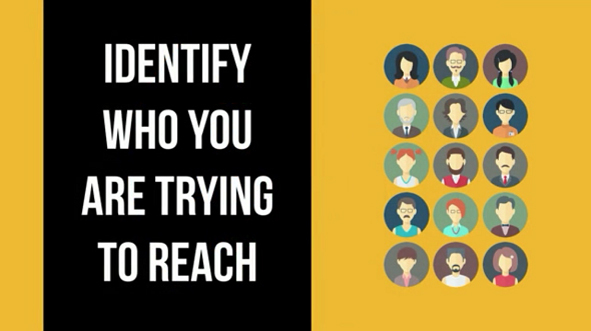 Again it will inform how you brand yourself, how you promote yourself, how you build community, and how you monetize. These things need to be crystal clear in your mind. Whether you’ve got an avatar or not, understand these things. Find out what is meaningful to them. When you understand those things, that is meaningful stuff. So understand what’s meaningful to them, and you can do it in a whole heap of different ways. For us, we use surveys. One of the things I love about live streaming, Periscope or a tool like Blab. Does anyone use Blab? It puts you into a conversation, a very real-time conversation with people. That’s great for broadcasting your ideas and for creating content, but it’s even more useful in terms of understanding the needs of people. I remember the first time I did a Blab, it’s like Google Hangouts, but it works. It put me into a conversation with three of my readers. And I’d never heard of them before. I didn’t recognize their names. But suddenly, I was seeing them on the screen, hearing their voices, hearing their frustrations, hearing their questions, and I wrote the best content that afternoon after that Blab because it was written out of the pain of my readers and the real life questions of my readers. So use these sorts of tools to understand who your readers are. I think the great thing about an event like this, if you have enough readers to hold an event is that you understand you meet those people. It will infect the way you create content. But here’s something where you can take your avatar writing to the next stage. Most people don’t do this. They have an avatar, they might know their reader’s problems, but here’s the question I’ll ask you, how will you change your readers? How are you going to change them? Here’s a simple exercise that you can do. Actually, before I give you the exercise, great blogs and great podcasts, they leave a mark on their readers. So I want to encourage you to think about the content you create. It’s not only getting people onto your list or getting them to know, like and trust you, but understand that that content that you create has the potential to change your readers. 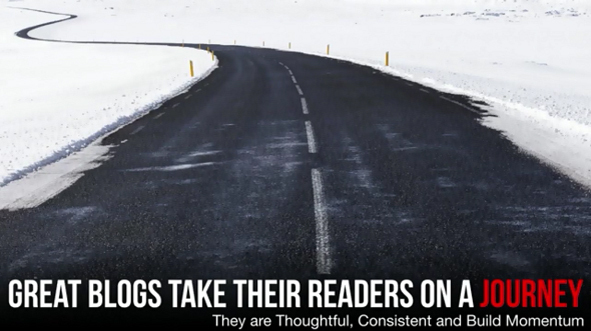 If you create content that changes your readers, that’s a very powerful thing because they’ll come back and they’ll bring other people with them. So here’s the exercise. You can do this later. It’s a very simple one. You just need a piece of paper and a pen, draw a line across it. Point A, I want you to describe who your readers are when they arrive on your blog, or your podcast, or where it is that you have first contact with people. This will be your avatar of sorts. It should include their needs, their problems, their desires and their fears. Those types of things. Most people do this when they’ve got a blog. But hardly anyone does this. 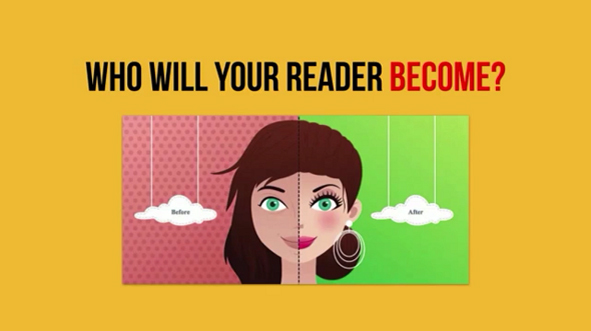 Where will your reader be as a result of coming into contact with you? Where will they be in a year’s time? Where will they be in five years’ time? What’s your dream for your readers, for your audience? Describe that change. Very powerful to understand that change. It should inform everything else that you do. It should inform the content you create, the products you create, the way you engage with people. Get crystal clear on that change. 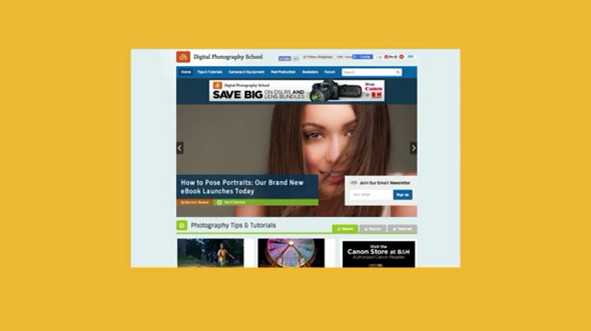 So Digital Photography School is my main blog. The change is very simple. 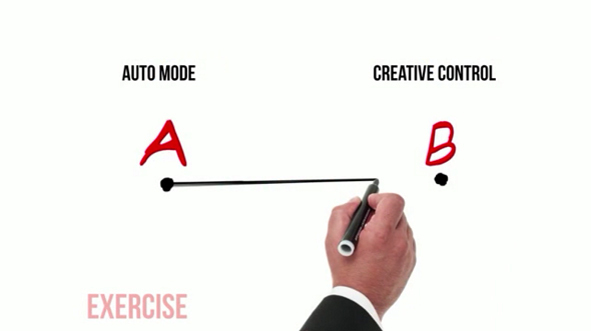 I want people to get out of automatic mode on their cameras and have full, creative control of their cameras. Most people use their cameras in full automatic mode. But they don’t know the full potential of their camera. So I want to give them creative control of their camera. That’s a very simple change. I talked to a parenting blogger the other day. She’s starting a whole membership site for parents. I got her to do this exercise. We were both in tears by the end of it because she described desperate families who couldn’t communicate, who are angry and dysfunctional. And then she described the most amazing families that you could ever imagine. What a change she is bringing. And by understanding that change, she suddenly had ideas for content. She suddenly had ideas for product. She suddenly had ideas for what her community could be. Do this exercise. Very, very powerful thing to do. 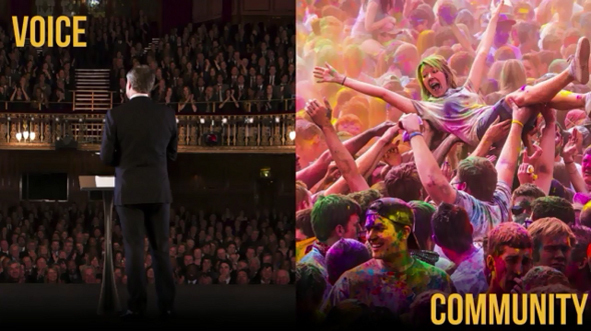 Essentially what you’re doing is creating a before and after avatar for your audience. 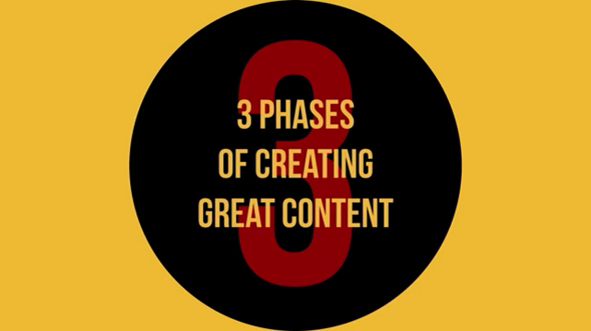 Number three thing I want to talk about is three phases of creating content. Most people have a content creation process that was kind of like my one used to be. You sit down and you think, ‘What am I going to write about today?’ Has anyone had that moment? And you spend the next two hours working at what you’re going to write about and then you write it and then you bang, publish, and it goes out. That’s the way I used to publish content. It was thoughtless, it was sporadic, and I very rarely built momentum from one piece of content to the next. Great blogs take their readers on a journey. Great podcasts take their readers on a journey. They build momentum over time. They’re thoughtful. They’re consistent. And they do build momentum. Have a think about those words. They don’t just happen. You need to be intentional about the kind of content that you create. 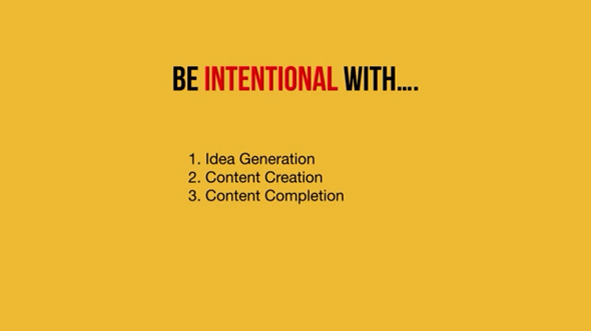 So I encourage you to be intentional in three areas of your content creation. I’m going to dig deeper into each of these. The first one is idea generation. Most bloggers can understand they need to come up with good ideas to write about, but most bloggers do it in the moment that they’re creating the content itself. I want you to consider doing that ahead of time. Secondly, the content creation phase. Most of us understand we need to put a time aside for that. And here’s the one I think most people could lift their game in. That’s the completion of the content. Most bloggers I come across either have a whole heap of drafts that they’ve never published. I had 90 at one point on the ProBlogger back end. Or they publish content that could be a whole heap better. They could be completing better. So I want to give you some tips in each of these three areas. That’s the next three points of my presentation. But before I do, I want to encourage you to put time aside for this. One of the things I loved in one of the early presentations was about separating your tasks out. James shared his weekly schedule before. I’ve got a little way to go to clear mine but this is how I structure most of my weeks. You’ll get these slides later and can look a little bit more deeply into it. But I put time aside. 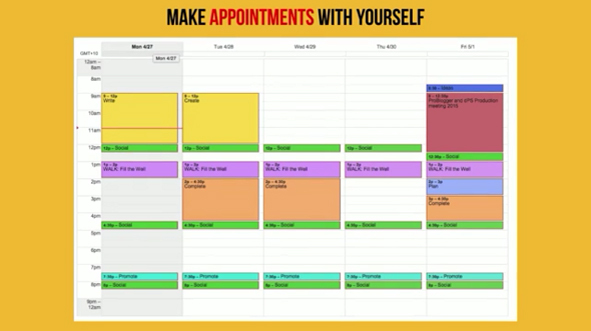 Every week, I make an appointment with myself every week to come up with ideas. It happens on Friday morning. I spend half an hour on it. That’s all. Half an hour and I brainstorm by myself. Then my team shows up for the meeting and I share what my ideas and they tell me which ones are good and which ones aren’t. They develop them a little bit further. We probably spend about 45 minutes in total on ideas and that type of thing. Friday afternoons, I spend time planning the content I’m creating next week. I find really useful on a Monday morning when I’ve got a slot allocated for creation of content to know ahead of time what I’m going to create that morning. I don’t have to come up with the idea. It’s already come up with and I’ve already given myself the deadline of when it needs to be created by. So Monday, Tuesday morning, I spend time creating, whether that be blog post, podcast, webinars or whatever it might be. In the afternoons, I’d spend time completing. And that’s really important for me to do because that’s my natural tendency is to publish half-finished content. I just like to get it out there without really going to the next level. I’m taking that content from being good to great. I want to show you how to do that in a moment. 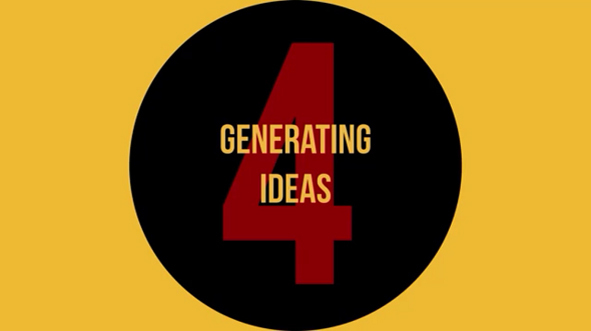 The fourth thing I want to talk about is generating ideas. Really, I want you to return to this exercise. This is what I did in 2007 when I started Digital Photography School. I worked out this overall change I was trying to bring and then I decided to fill in the gaps. So for you to take your audience from one point to the next, what needs to happen, what do they need to know, what mindshifts need to happen, what skills do they need to develop, what areas do they need to build their confidence in? I started to fill in the gaps. Here are some of the things I came up with for my audience. They needed to learn about aperture and shutter speed and some of those technical things they needed to grow in their confidence. They needed to understand really basic skills of how to hold a camera. I came up with 207 things in this exercise. It took me a whole afternoon to do it. I returned to it the next day, came up with another 100. So I had about 300 things that my readers needed to do to get from fully auto to creative control. That was my first two years of content for the blog. 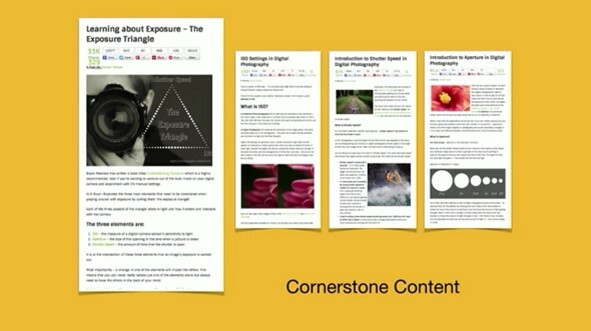 I turned that content step-by-step into cornerstone pieces of content that I gave away to my audience. I placed them in an order that would take my readers on a journey from being in fully automatic mode to having creative control of their cameras. These four pieces of content here were some of the first pieces of content that I wrote. I looked at the stats the other day. Each of those pieces of content has been read over 2 million times since I started. To this day, it still gets thousands of people to each of these pieces of content. I’m constantly linking back to these cornerstone pieces of content. So every time I mention the word aperture, it links back to the aperture article. Every time I mention shutter speed, it links back to the shutter speed article. And it’s because I mapped out the whole roadmap ahead of time that I knew with confidence that at the end of those two years, I had the base of what I was wanting to teach. So do that exercise. It’s very powerful. If you’re ever running out of ideas, again, think about the change you’re trying to bring and build a roadmap for your readers. 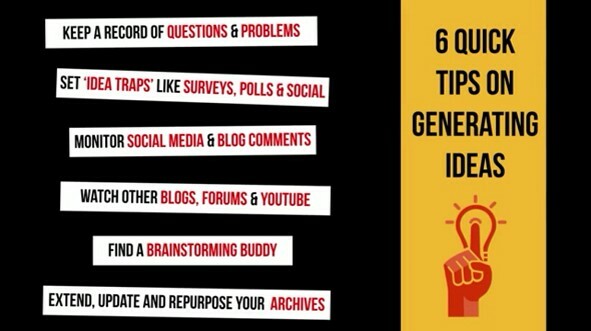 Six more really quick tips on generating ideas. You need to keep a record of every question you’re ever asked. Or every question you ask yourself. Every problem you ever notice. Again, this is the thing I love about live streaming, Periscope, it’s the thing I love about webinars, coming to conferences, I’m constantly writing down the questions people ask me. If one person is asking them, other people are asking them too. Set idea traps. This is so powerful. The best thing I ever did for coming up with ideas was to set up a survey. I did it on day three of Digital Photography School. When I set up an autoresponder, so you sign up to our newsletter, two or three months after you’ve been getting these newsletters, I send you an email saying, “Would you mind filling in a survey? It helps us to understand you better.” It collects a little bit of demographical information about our audience, but there’s an open-ended question in it too. I’ve come across a number of bloggers recently who’ve set up Facebook groups and they run polls every week in their Facebook group to test five different ideas for articles that they’re thinking about writing and they get their Facebook group members to vote on which one they want them to write a piece of content about. So set up these little traps to collect ideas. You should be monitoring every blog post you write, every tweet you put out to collect those questions. And if you don’t have people reading your blog yet and leaving comments, head to someone else’s blog and look for the questions. 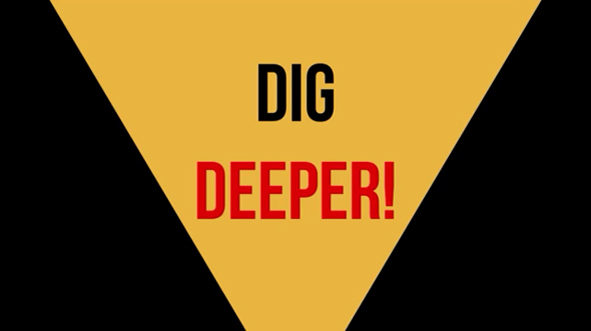 Someone who’s a bigger blogger in your niche. YouTube is the best place ever to come up with questions. 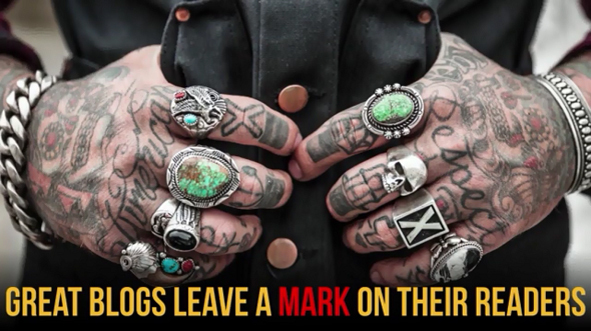 The comments left on YouTube clips in your industry will give you ideas for blog posts. Forums also. We used to run a forum on Digital Photography School. It was amazing how many people would set up an account and only ever post one thing. It was almost always a question. 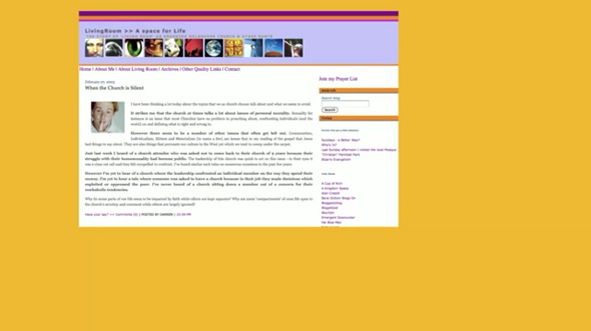 People join forums to ask questions. So you need to seek in those places and collect those sorts of questions. And then find a brainstorming buddy. I don’t know if you’ve got these but one of the best things I did when I started ProBlogger was to just commit with two other bloggers in my niche to throw out ideas at each other and to give each other ideas to write about. We became writing buddies. And then the last thing, and this is something that’s very simple to do particularly if you’ve been blogging or podcasting for a year or two is to look back on your archives and ask yourself the question, ‘How could I extend that old post, or repurpose it, or update it in some way?’ I actually do this every day. Every day, I look back at what I published this day last year. And this day the year before on this same date, and I actually go back through the archives all the years that I’ve been writing every single day to ask myself the question, ‘Is that post still relevant? Could I update it? Could I repurpose that content in some way?’ That’s where most of my podcasts for the first year of my podcasting have come from, just looking back at the blog posts that I’ve written, and repurposing them, and updating them. Great great info and presentation and thanks James for sharing and Darren for creating it!